Euro 2020 qualifying draw: How does it work? The Euro 2020 qualifiers will be drawn on Sunday at 11:00 GMT in Dublin. The top two teams from each of the 10 groups will qualify for the tournament, which is being held in 12 countries. 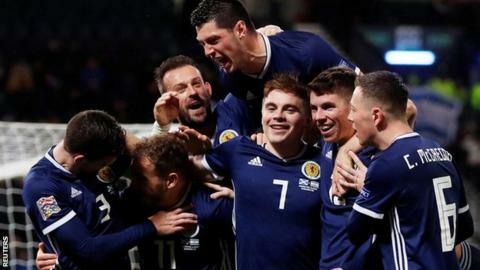 Scotland and England are guaranteed a play-off place if they fail to qualify, with four extra places available through the Nations League play-offs. England - who will be in a five-team group - are among the top seeds, with Wales in pot two and Scotland, Northern Ireland and the Republic in pot three. Germany are in pot two after their Nations League relegation. Five of the 10 groups will have five teams, with six teams in the remaining groups. The seedings were done based on Uefa Nations League positions - with the four finalists in a special pot to make sure they are in a five-team group, ensuring they have free dates for the finals in June 2019. Former Republic of Ireland duo Robbie Keane and Ronnie Whelan and Portuguese pair Vitor Baia and Nuno Gomes are assisting with the draw. Arguably the toughest draw England could face would be to find themselves in a group with Germany, Slovakia, Greece and Kosovo. A more straightforward draw - on paper at least - would pit them against Ukraine, Bulgaria, Cyprus and Gibraltar. Wales are in pot two, meaning they cannot face Germany, while Scotland, Northern Ireland and the Republic are in pot three, so could end up with France and the Germans above them - or a more favourable draw could see them face Poland and Ukraine. But is it quite that simple? No, it never is. There are several restrictions on who can be drawn with who. Uefa has tried to "allow all 12 Euro 2020 host teams a chance of qualifying" - so no more than two nations staging games can be in the same group. Those teams are England, Scotland, the Republic of Ireland, Germany, Spain, Italy, the Netherlands, Azerbaijan, Denmark, Hungary, Romania and Russia. Because the draw works from the top seeds downwards, it means that if, for example, England were drawn with Germany, Denmark or Russia, they could not then be in a group with the Republic of Ireland or Scotland. For political reasons, Spain and Gibraltar will be kept apart, while Kosovo cannot be in a group with Serbia or Bosnia-Herzegovina. A maximum of two countries at risk of severe winters can be in one group - Belarus, Estonia, Faroe Islands, Finland, Iceland, Latvia, Lithuania, Norway, Russia and Ukraine. And there are restrictions over who Kazakhstan, Azerbaijan and Iceland could play for geographical reasons. Each side can only be in a group with one listed country that would involve excessive travel distance. In Kazakhstan's case, that includes the home nations and Republic of Ireland. When does qualifying start and finish? The first round of qualifiers start on 21-23 March 2019 - and the final games are on 17-19 November 2019. The Nations League finalists are not in action on matchday two or three - in June 2019 - so they can play the finals of that tournament. What happens next, including the play-offs? With the top two qualifying from each group, the only play-offs are those from the Nations League positions. Each team who won their Nations League group qualifies for a play-off place - unless they advance automatically through the regular qualifiers. In that case, the next best team in their league (in terms of position in their group, points and goal difference) take their play-off place. The play-off draw is on 22 November 2019, with the semi-finals and finals being played from 26 to 31 March 2020. The draw for the tournament itself will already have taken place - on 1 December 2019. Euro 2020 runs from 12 June to 12 July. Who is most likely to qualify? Statisticians Gracenote have worked out the teams most likely to qualify for Euro 2020. England have a 95% chance of reaching the tournament, with only 8% odds they need to play their play-off. Wales just make the top 20 most likely qualifiers with a 63% chance of progressing. They rank Scotland, Northern Ireland, Wales and the Republic in the most likely 16 teams to end in the play-offs.